Mysterious lights and sounds are coming from Radon Canyon. Plus, tips on how to win the town lottery, our newest (incorporeal) School Board member, and the abandoned mineshaft finally gets HBO! Produced by Night Vale Presents. Written by Joseph Fink and Jeffrey Cranor. Narrated by Cecil Baldwin. 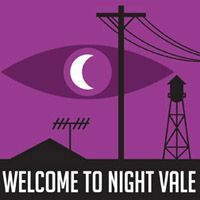 More Info: welcometonightvale.com, and follow ... See More @NightValeRadio on Twitter or Facebook.